This timely review was requested by the Secretary General of the Council of Europe, Thorbjørn Jagland, on 23 November 2016. He indicated that the findings of the review would allow him to consider the need for the Committee of Ministers to issue new guidelines on funding for NGOs. For Human Rights House Foundation, and independent civil society organisations everywhere, such guidelines cannot come soon enough – adding to the weight of UN resolutions and opinions urging the need to ensure access to funding without hindrance. More and more countries are adopting restrictive and stigmatising laws and practices that hinder foreign funding for civil society, especially human rights organisations and defenders, and this is increasingly the case in Europe as well. HRHF documents these growing restrictions in its report “Funding Civil Society”, which it presented at consultations with the Venice Commission on 4 October 2017, as experts were gathering information during the early stages of the review. Such clarity is welcome. NGOs should be free to engage in fundraising activities under the same regulations that apply to other entities and the State, whether working on human rights or other activities, and that the funding comes from abroad is not a sign of criminal or nefarious activity. Such discriminative restrictions and practices are tools to control and ultimately hinder access to funding for NGOs not obedient to the government. With such restrictions, authorities aim at replacing independent civil society with groups indebted to those in power. 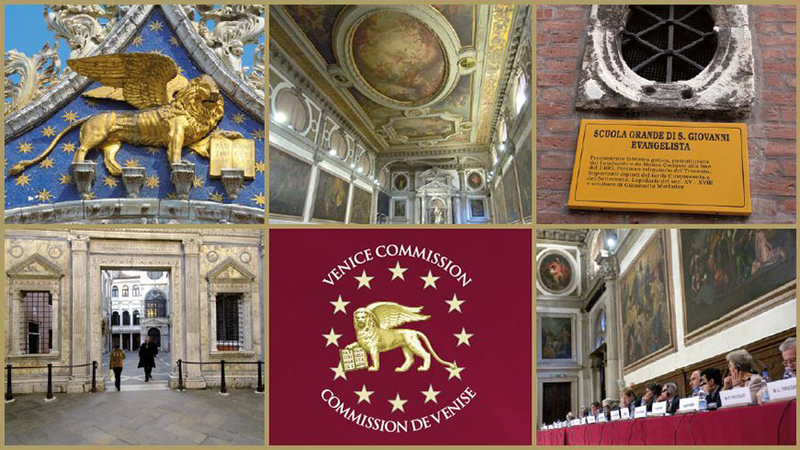 Addressing some of the justifications given by states for restrictions on funding, the Venice Commission provides more in-depth recommendations as to the proportionality of interference with the right of associations to seek financial and material resources. The review further holds that “no legal regulation should… infringe upon the democratic rights of individuals to express their opinions, conduct advocacy activities and campaign for political change,” stating that it is illegitimate to restrict association activities merely to advance political goals. Many States seek to justify restrictions on NGO funding as necessary to stop the commission of crimes such as financing of terrorism or money laundering, with measures including limiting access to funding by imposing extensive scrutiny or cumbersome fiscal procedures for NGOs. Almost 60 countries adopted foreign funding restrictions between 2012-2014, according to the research by the International Centre for Not-for-Profit Law. The UN Human Rights Council has already reiterated that States should not impose restrictions on potential sources of funding for human rights activities, other than “those ordinarily laid down for any activity unrelated to human rights to ensure transparency and accountability.” This point is essential: States must not discriminate against NGOs, whatever the context. “Funding is at the core of the right to freedom of association, which is an indispensable right enabling citizens to monitor the human rights situation in a country and to support the implementation of human rights policies. Restrictions impede organisations’ sustainability, autonomy, and ability to work. The consequence is that critical voices are suppressed,” comments Maria Dahle, Director of HRHF. “We urge States and international institutions to address restrictions on foreign funding wherever they arise, and to continue to support independent civil society. This report by the Venice Commission builds on the issues experienced and raised by civil society. It should not remain simple advice, but become standards that are fully implemented in every country – with the international community holding countries accountable to these standards. We ask that the Committee of Ministers uses these findings as the foundation to develop guidelines that can be embraced by all Council of Europe member States,” continues Dahle. The reality is that in countries where Human Rights Houses operate, HRHF has seen these illegitimate restrictions grow, particularly targeting NGOs that work on sensitive issues – monitoring elections, exposing corruption, working on women’s rights and LGBT rights, and upholding the rights of refugees. The report by the Venice Commission specifically raises Ukraine, Hungary, Russia, and Azerbaijan as countries that have adopted concerning legislation. In July 2012, the Russian Federation enacted the federal law known as the foreign agent law. This law requires all non-commercial organisations to register as “foreign agents” before receiving funding from any international sources if they intend to conduct political activities. The cynicism of the measure is that it does not ban or restrict the access to international grants; it requires that NGOs receiving such grants are to declare they work for a foreign power. The legislation stigmatises human rights defenders, and those branded as “foreign agents” are ostracised in society. The law thereby constitutes a de facto ban on foreign funding for groups not wishing be classified in this manner. As such, it effectively criminalises human rights work, given the heavy criminal penalty foreseen in the law (up to four years imprisonment and/or fines of up to 300,000 Roubles, approximately 4,400 €). An amendment to the law on 4 June 2014 gave the Russian Ministry of Justice the right to register organisations as foreign agents without a court ruling, leading to an increase in the number of NGOs in the register. The Russian Federation amended the foreign agent law on 25 May 2016 to clarify the definition of the term “political activity”. Following this, expression of public opinion and any kind of contact with authorities, even requests for information, could be considered political. The Russia Federation again published amendments to the foreign agent law in November 2017, that would allow the government to designate media outlets receiving funding from abroad as “foreign agents” and impose sanctions. Aside from this, on 19 May 2015, Russia adopted a law that criminalises “undesirable organisations”. The law states that foreign institutions can be declared “undesirable” if they “present a threat to the basic constitutional order of the Russian Federation, the defence capacities of the Russian Federation or its national security.” The law allows for an extremely broad interpretation, giving full leverage to authorities to use the law against its critics. Azerbaijan adopted repressive amendments to NGO legislation in November 2014, as President Aliyev approved amendments to the Law on Grants, NGOs and State registration of Legal Entities. This legislation has been widely used to prevent NGOs from carrying out their activities and receiving foreign grants. The authorities impose strict administrative rules to arbitrarily and indefinitely delay the registration of NGOs, while foreign donors need to go through an onerous multi-tier system that makes funding of local NGOs practically impossible. On 23 March 2017, the Ukraine parliament adopted amendments to the legislation governing the electronic declaration of the wealth of State officials and civil servants (law “on corruption prevention”). 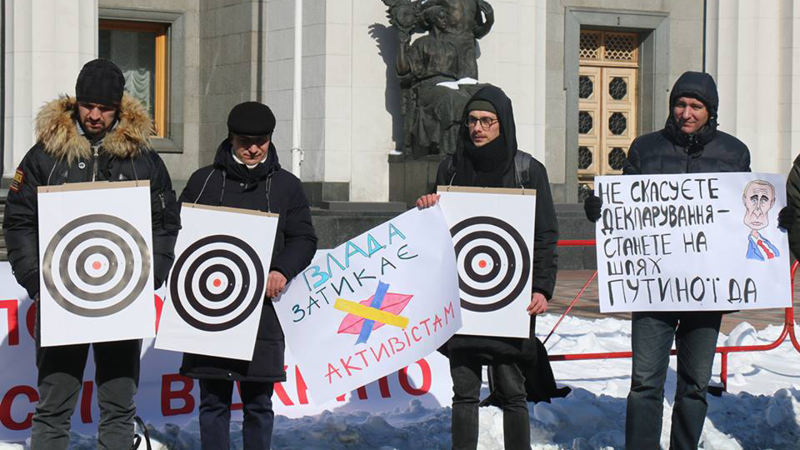 On 19 March 2018, human rights activists protested outside the Verkhovna Rada (Ukrainian parliament) to demand that the authorities abolish the e-declarations for activists in Ukraine. Photo: © Yelizaveta Sokurenko, Human Rights Information Centre. Some 31 member and partner organisations of Human Rights Houses raised concerns that the aim of the legislation is to intimidate civil society working on corruption issues in Ukraine, and ultimately to discredit NGOs. Another two proposed laws would have obliged non-governmental organisations to publicly publish detailed online reports on their employees and funding. Ukrainian organisations labelled this as “disproportionate interference” in their activities. The laws were not adopted, partly thanks to the campaign by human rights organisations against them.